Sold in packages of 100. All Louet looms use Texsolv heddles. Texsolv heddles are lighter, slide easily along pattern shafts, make no noise during operation and can be added or removed as required. 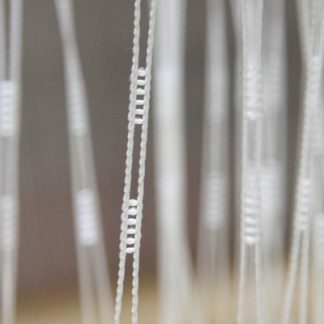 Ease of adding heddles varies from loom to loom. Demonstrations of how to add heddles can be seen on our Weaving DVD. 205mm (8″) – black twist-tie heddles for Jane/W40/W70/Kombo table looms.